Andrzej Wajda. Official Website of Polish movie director - Films - "The Orchestra Conductor"
Frustrated as we all were at that time in Poland, not knowing what to do, we felt in the air a kind of expectation for a miracle to happen; perhaps a longing for some kind of model, especially if it came from the West. It was to be personified by a world-famous conductor, leading an anniversary concert in the small Polish town where he had been born. Accordingly, the story had to take place in a provincial town, with its obtrusive and ruthless local dignitaries. All sorts of party leaders, unworthy creatures typical of the so-called "films of moral unrest", found their way onto the screen. Andrzej Kijowski made two important alterations to his script. He devised the awe-inspiring, if slightly absurd, main character - the hallowed maestro, absolutely dedicated to his art and taking the admiration of his companions for granted. Also, Kijowski added the story of the young couple whose marital troubles begin when the husband, a conductor himself, becomes jealous of the admiration which his violinist wife feels for the maestro. After Karol Wojtyla became Pope, the pace of events suddenly accelerated in Poland. The "Visitor-from-the-West" did no longer have to be a monster. We expected such a personage to be our patron and guide. The dream was already there, but the likelihood of a visit by John Paul II to Poland seemed unrealistic. Very quickly the script got out of control and the film began to evolve in its own way. Since his film debut Wajda has filmed conflicts between the older and the younger generations. In his early days, he sided with the young. Now, he tends to take the side of maturity. In Man of Marble the shift was barely noticeable, but became more pronounced in Rough Treatment. In The Orchestra Conductor it is obviously premeditated. This new point of view is emphasised by the fact that John Gielgud not only looks old, but also is known for his advanced age. Although his hero is nearing the grave, both the young female violinist and other members of the orchestra are fascinated by him. This new point of view is also reflected in the style of direction: the proportion of direct action has been reduced in favour of contemplation. The purpose is no longer to act and to achieve, but rather to understand, or even to reflect. Like Fellini in The Orchestra Rehearsal, Wajda is not interested in the activity in which the conductor and the orchestra are directly involved: he is not concerned.with their music and its quality. The director himself confessed at some point that he didn't pay much attention to the music, which is not his speciality anyway. What really attracted him about the orchestra was its quality of a social organism in miniature, ideally suited to convey all sorts of metaphors pertaining to society, its organisation, and interpersonal relations in general. It is Poland that he has portrayed in the guise of the orchestra. An inner restlessness and indecision mark The Orchestra Conductor: we are not sure what are its conflicts, its arguments, or its message. Not quite knowing which direction to choose, Wajda tends to digress into blind alleys and superfluous additions. The capacity to show the process of gradual growth has never been his speciality; explosive emotions, tempestuous action and spontaneity were always his real element. 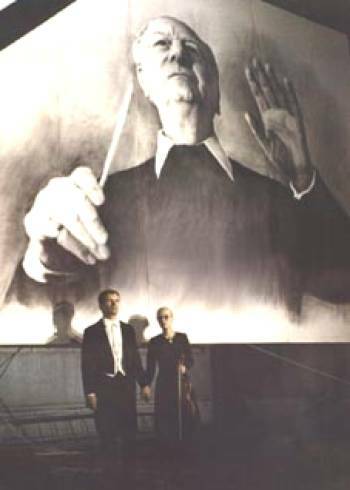 (...) The Orchestra Conductor seems to lack not only emotional clarity, an imaginatively lucid message or a style of its own, but also that wonderful tension between Image and Cause, which characterises Wajda's greatest works.